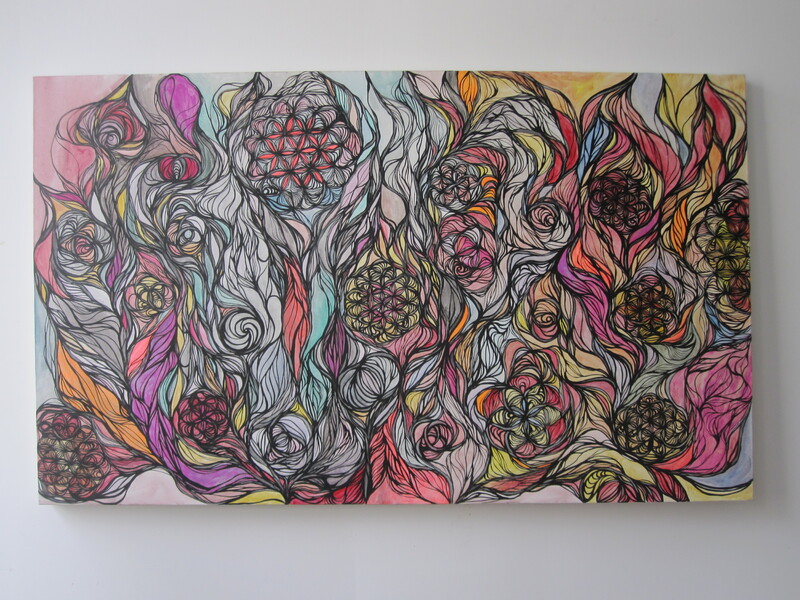 Lakshmi’s Garden is a listening painting made with ink and acrylic paint. For this piece, I listened to the mantra ‘om shreem mahalakshmiyei namaha’ throughout its creation. Lakshmi is a Goddess of Abundance. I imagined that her garden of heavenly delights would be filled with the mystical seeds of future earth fruits that begin with sacred geometry and flow into organic forms. The landscape is all colours and is more like the free-floating lightspace of very small and very large perspectives unbound by the usual horizon that human bodies experience while relating to the heavenly body of earth.